Update: The twelveth edition of World Future Energy Summit (WFES) will be held from 14-17 January 2019 in Abu Dhabi National Exhibition Centre (ADNEC), United Arab Emirates. Hosted by Masdar. WFES promotes innovation and investment opportunities surrounding renewable energy and environment. World Future Energy Summit continues to set the agenda for a global discussion on the future of renewable energy, clean technology and sustainability. A platform for governments, corporate decision-makers, investors, entrepreneurs and opinion makers, World Future Energy Summit is an annual meeting place that promotes dialogue, fosters knowledge transfer and accelerates strategic decision making in the pursuit of viable solutions to the world’s growing energy challenges. Our conferences are carefully researched and designed to pinpoint opportunities for growth and profitability, and provide attendees with access to the best thinking, best practices, and innovations in clean energy deployment. 26-01-2012: The sixth edition of WFES 2012 will be held from 15-17 January 2013 in Abu Dhabi National Exhibition Centre (ADNEC), United Arab Emirates. Hosted by Masdar. WFES promotes innovation and investment opportunities surrounding renewable energy and environment. Under the Patronage of H.H. General Sheikh Mohammed bin Zayed Al Nahyan Crown Prince of Abu Dhabi and Deputy Supreme Commander of the UAE Armed Forces. World Future Energy Summit is the world’s foremost annual meeting committed to advancing future energy, energy efficiency and clean technologies by engaging political, business, finance, academic and industry leaders to drive innovation, business and investment opportunities in response to the growing need for sustainable energy. 19-01-2012: Sunny Dubai to Make Large Investment in Solar Power. The Middle East has two things in abundance – oil and sunshine. Seeking to capitalize on the latter, Dubai’s Supreme Council of Energy has presented plans for the 1,000 megawatt Mohammed Bin Rashid Al Maktoum Solar Park at the World Future Energy Summit. 10-01-2012: The fifth edition of WFES 2012 will be held from 16-19 January 2012 in Abu Dhabi National Exhibition Centre (ADNEC), United Arab Emirates. Hosted by Masdar, WFES promotes innovation and investment opportunities surrounding renewable energy and environment. Under the Patronage of H.H. General Sheikh Mohammed bin Zayed Al Nahyan Crown Prince of Abu Dhabi and Deputy Supreme Commander of the UAE Armed Forces. The 5th edition, World Future Energy Summit continues to provide the leading platform for international policy makers, innovators, business decision makers and investors to explore global energy challenges with the view to creating real and sustainable solutions. 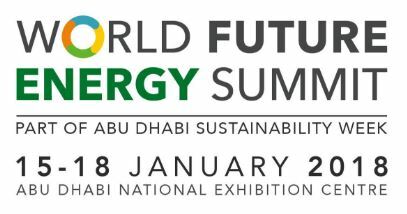 In 2012, WFES will bring together more than 150 eminent thought leaders to reveal the latest innovations and discuss the burning issues surrounding future energy. This is your opportunity to hear cutting-edge information, gain first hand knowledge, and discuss with international colleagues the challenges and solutions for achieving clean, secure and sustainable energy for all. This year’s Summit program has been designed to address the theme Powering Sustainable Innovation. As the global demand for energy continues to escalate, it is innovation which will transform our traditionally fossil fuel based energy into a diverse mix featuring renewable and sustainable energy sources. It is innovation which will enable the development of advanced clean energy technology and continue to make huge leaps forward in improving energy efficiency. 28-08-2010: Since its inception in 2008, World Future Energy Summit “WFES” has evolved as the world’s foremost and must-attend annual meeting for the renewable energy and environment industry. In 2010 WFES uniquely brought together over 24,760 attendees from 148 countries including world leaders, international policy makers, industry leaders, investors, experts, academia, intellectuals and journalists to find practical and sustainable solutions for today’s energy security and climate change challenges. Alongside the summit, two exhibitions are held: the World Future Energy Exhibition, focused on advanced and renewable energy, and the World Future Environment Exhibition, dedicated to air, water and waste management technologies and solutions. Previous WFES speakers have included Britain’s HRH Prince Charles, HRH Willem-Alexander of the Netherlands, President Olafur Grimsson of Iceland and Former British Prime Minister Tony Blair, Former U.S. Energy Secretary Samuel Bodman and Dr. Rajendra Pachauri, Chairman of the Intergovernmental Panel on Climate Change. The fourth World Future Energy Summit (WFES) will be held from 17 to 20 January 2011 at the Abu Dhabi National Exhibition Centre and built on its previous three editions to create a collaborative platform to tackle policy, innovation and investment issues surrounding renewable energy. WFES promotes innovation and investment opportunities surrounding renewable energy and environment. It represents an unrivalled business platform bringing together project owners and solution providers with investors and buyers from both the public and private sectors. WFES includes a world class summit, two exhibitions, young future energy leaders program, round table discussions, industry and investment seminars, corporate meetings and social events. LAGI is a first-of-its-kind interdisciplinary collaboration that has brought together global artists, architects, scientists, landscape architects, and engineers to design energy-generating public art installations to be considered for construction in Dubai and Abu Dhabi. The international competition, which closed on June 4, 2010, received entries from over 40 countries. Each sculpture will continuously distribute clean energy into the electrical grid with the potential to provide power to thousands of homes. This week in Abu Dhabi — an emerging renewable energy hub — 800 delegates from more than 150 nations united to hold the first session of the International Renewable Energy Agency (IRENA). The organization was formed to bring a dedicated global effort to promoting the adoption of renewable energy. The International Renewable Energy Agency (IRENA) is an intergovernmental organization for promoting the adoption of renewable energy worldwide. It aims to provide concrete policy advice and facilitate capacity building and technology transfer. IRENA was formed on January 26, 2009 by 75 founding nations. The aim is to have the agency fully operational by the end of 2010 with an initial annual budget of US$25 million by 2011. As of June 2009, IRENA has 92 Member States. Sjeik Mohammed bin Rasjid Al Maktoem, vicepresident en premier van de VAE en emir van Dubai, heeft de vierde fase opgestart van het Mohammed bin Rashid Al Maktoum Solar Park. Dit is het grootste investeringsproject voor geconcentreerde zonne-energie (CSP) ter wereld, gebaseerd op het Independent Power Producer (IPP) -model. Het zal 700 MW genereren op een locatie en beschikt over de hoogste zonnetoren ter wereld van 260 meter hoog en de grootste thermische opslagcapaciteit ter wereld. Het levert schone energie aan 270.000 woningen, waardoor jaarlijks 1,4 miljoen ton CO2-uitstoot wordt verminderd. Het project zal twee technologieën gebruiken: een parabolisch bassincomplex van 600 MW en een 100 MW zonnetoren.